With more than 140 breweries now in San Diego County, it’s difficult to single out any brewery in the area as the best of the best, but without question, one of the breweries that continues to stand out is Green Flash Brewing Company. The brewery, which opened back in 2002 is one of the staples of the community, and has delivered one amazing beer after another. As if that wasn’t enough, the recently acquired Alpine Beer Company from Alpine, CA. Also a mastery brewery, the combination of the two definitely puts them near the top of the list of best breweries. In recent years, the brewery has increased their output and production, and with another location set to open up in Virginia Beach, VA, this year, there’s no question that Green Flash beers will be available just about everywhere in the country. Green Flash is largely responsible for the explosion of the west coast IPA style throughout the country. Their India Pale Ale, simply named West Coast IPA is a heavily hopped brew that comes in at 93 IBU. It definitely attacks the taste buds, and delivers a high-dosage of hops and bitterness. If looking for a true, big and bold IPA, this will deliver a great example of the style. The great thing about Green Flash is that they’re constantly releasing special releases to go alongside their year round beers. In addition to the year round brews such as Soul Style IPA, 30th Street Pale Ale, Le Freak, and others, you should also look for a seasonal such as the 10.1% Green Bullet IPA, or the Jibe IPA, a simple session at 4.0%. As mentioned, they recently acquired Alpine Beer Company, so if you are fortunate to secure anything from Alpine, they are definitely worth trying. Their Nelson IPA reigns supreme in their lineup, but others including Pure Hoppiness, Duet, or the rare Exponential Hoppiness are all must-haves. If there’s one thing that can be said about Green Flashing Brewing Company, it is that you will be hard-pressed to find more consistently, well-executed beers. You may not like everything that they brew, as their styles can be far and wide, but it is clear that they know how to brew a good, solid beer. 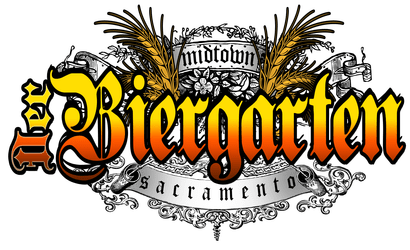 Next time you’re sitting at Der Biergarten in Sacramento, CA, be sure to look over the menu for something from one of these breweries. Trust us, you won’t be disappointed! Ryan McKillop’s Beer Review of St. Archer Black at Der Biergarten! 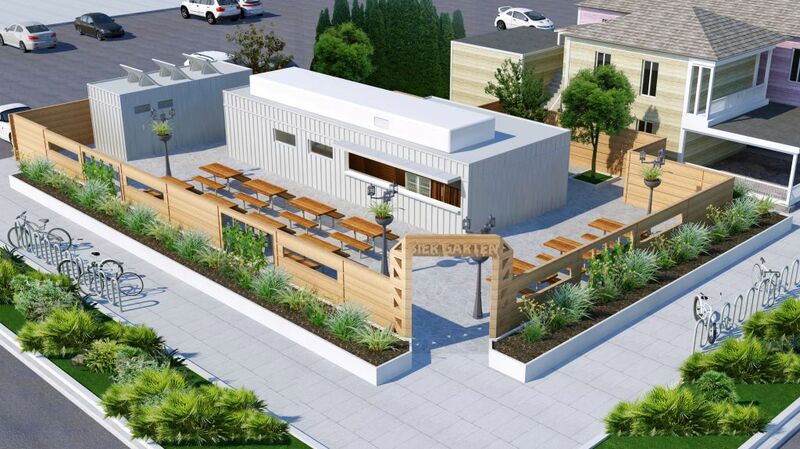 Midtown Sacramento Beer Garden To Open! The long-awaited Der Biergarten opened its doors this weekend at 24th and K streets. Midtown has a new home for foam at Der Biergarten, the long-delayed open-air beer destination that served up its first official brews over the weekend at 24th and K streets. Local hopheads can try one of 32 draft beers and munch from a food menu of sausages, hot dogs, pretzels, salads and “Belgies”—ham sandwiches on waffles brimming with esoteric extras like mustard, cream cheese or chipotle raspberry sauce. Visitors order from a tap house and kitchen converted by owner Sean Derfield from industrial-size shipping containers, and gather at rows of communal tables or among the boisterous, streetside crowd framed by heavy redwood rails. And while the place thrums with couples and groups (and even some of their dogs; the establishment is pooch-friendly) from happy hour to closing time, Der Biergarten is both scene and sanctuary for true beer believers of any (legal) age. The selections split evenly between classic German offerings and excellent West Coast brews; one-liter steins of Hofbrau Dunkel and Weihenstephaner share table space with tall, blooming glasses of golden Erdinger and svelte, sumptuous pints of Black Butte Porter from Deschutes Brewery in Oregon. Choice beer picks include the Alt-Bier from Redlands-based Hangar 24 Brewery as well as Der Biergarten’s house blonde ale crafted by Lost Coast Brewery in Eureka and Buffalo Lager from Sacramento’s own New Helvetia Brewing Co. On the food side, the decadent DerFinator—a cheese-stuffed, bacon-wrapped, BBQ sauce-doused hot dog delivered on a bun slathered with cream cheese, red onions and Der Biergarten’s “secret garlic sauce”—is a must for meat-lovers, while vegetarians won’t go hungry with options like the hearty pretzel (served with mustard and cheese sauce) or cucumber salad with vinegar and dill dressing. 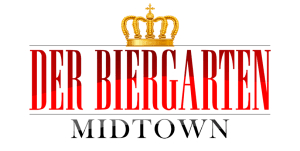 Der Biergarten is open seven days a week from 3 p.m.-10 p.m., weather permitting (“If it’s raining we are closed,” its website announces up front). Browse the full beer list and more atbeergardensacramento.com. For more on the local beer scene, pick up the February/March issue of Sactown Magazine for our complete Beer Lover’s Guide to Sacramento. Find a location near you here. Article released in Sacramento State Hornet newspaper. Der Biergarten, opening up on the corner of 24th and K streets in Midtown, has promise to be a unique eatery Sacramento has not yet to seen. Sean Derfield, owner of the River City Saloon,has been developing the idea since 2011 when he decided to build a German-themed beer house in the European open-air fashion. Derfield said the new beer house will resemble San Francisco’s Proxy, a model of urban planning that demonstrates how a business can be successful by transforming underused areas like empty lots. Thomas Roth, property manager of the plot agreed to the project because he thought it was such an interesting plan. But the project has been anything but easy to accomplish. Derfield said he has hit his share of speed bumps, mostly because of the use of the open cargo containers. The plans to open before summer were delayed and Derfield was forced to open the exposed garden right before winter. “It turns out that if you’re the first one to do something like this, they have to absolutely make sure it’s getting done right,” Derfield said. One of the most exciting things about Der Biergarten is that it of only two beer gardens in Sacramento. Low Brau, located on 20th Street, opened last November. 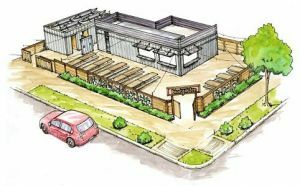 Local restaurateurs, like Golden Bear’s executive chef, Matthew Brown, have also shown support and are anxiously waiting for the new beer garden to open. “Everybody over here is excited and just waiting for it to open so they can check it out,” Brown said. The garden will include concession style food, an open porch to sit and foosball and ping-pong tables. Derfield said the most important part of the business is its unique drafts. Der Biergarten certainly promises to be something Sacramentans have not quite seen, especially for a traditional beer hall with an urban twist. 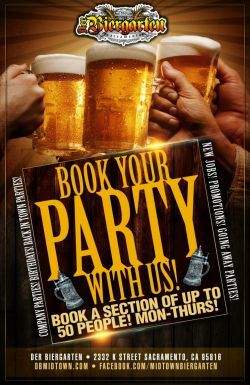 Although there has not been a specific opening date, those interested can go to www.beergardensacramento.com for more information. The lot has been empty for a decade. 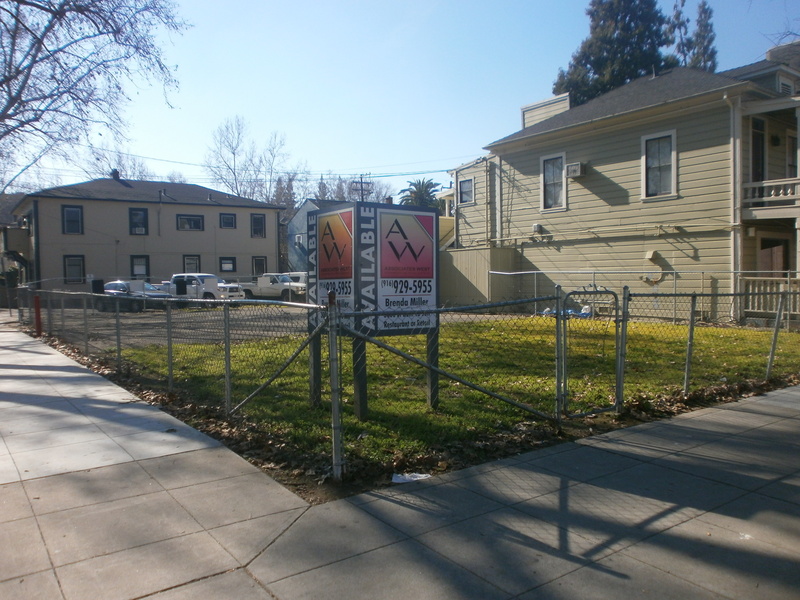 “Before this fence was up, they actually had problems with homeless and tents being set up,” said Sean Derfield, who wants to build Der Biergarten. Derfield said he wanted to borrow from an idea used in other cities, using refurbished cargo containers as instant buildings for the kitchen and restrooms. Derfield is shipping picnic benches and beer steins from Germany for the open-air establishment. He said it will be closed on rainy days, but points out there are only about three dozen rainy days in Sacramento a year. Derfield said he has made changes to plans, to accommodate concerns about noise in the Midtown neighborhood and to ensure the appearance. People who live and work nearby think the beer garden could do well. “We need something here, so I’m glad they are going to do something,” Ashley Mathew said. Paragary Restaurant Group, meanwhile, said it will close Spataro Restaurant and Bar — across from the State Capitol. Story in the Sacramento bee about the opening of Der Biergarten in Midtown Sacramento. Sean Derfield plans to open his latest venture, Der Biergarten, at 2332 K St. in midtown Sacramento in late August, but he’s still reliving the year it took to get his project through the city’s design review process. Der Biergarten will be a German beer garden, an outdoor venue where customers can come for sausages, potato cakes, sauerkraut and, of course, German and Belgian imports or a local beer brewed in the German style. Derfield identified a vacant lot next to the Golden Bear, and he shared his vision for a beer garden with the man who would be his landlord, Thomas Roth. Derfield wanted to do something he’d seen in a number of cities around the world, including one 75 miles west of here. “We were in San Francisco, and they have a project called the Proxy Project down there,” he told me, “and basically, that project was using cargo containers for a German beer garden, so what they do is they have a restaurant serving beer and food from these cargo units. So we said, ‘You know, that would probably work in Sacramento.’ ” Thom Roth bought into the idea of cargo containers that could be removed in five years or so, if he wanted to develop a more permanent project on the lot. Derfield said he also received a warm reception in preliminary meetings with the city’s design review team in October, but after he hired an architect and contractor and submitted renderings in January, the tone changed completely. Attempts to reach city urban design manager Greg Taylor were not successful. City planners made suggestions that Derfield at first interpreted as optional. A stucco-like exterior will make it hard to recognize the structures as cargo containers, and patrons won’t be able to people-watch on the street. It’s not the funky, artsy feel that Derfield had envisioned, but he’ll be glad to open. In a sea of sushi bars, coffee shops and pizza by the slice, Sacramento has its share of copycat eateries. But a new German-inspired venue that is on the corner of 24th and K streets could shake up the gastronomical monotony. Der Biergarten is being touted as the newest plan that’s derived from one of Europe’s oldest traditions – Oktoberfest. Sean and Erika Derfield, who own the River City Saloon in Old Sacramento, visited the Midtown Neighborhood Association Wednesday evening to present their plans to unveil a new restaurant that will be located in an area that’s readily walkable, has biking access and is already buzzing with healthy local traffic. The lot itself has stood undeveloped for a number of years. According to the Derfields, they are looking to use oversized cargo containers that customers can walk up to and order homemade pretzels, schnitzel, fresh sausages, and a variety of Belgian and German beers. Local brew and wine will also be featured regularly. Open seating, casual dining and foosball and pingpong tables are all part of the new proposal. The Derfields said they hope to create the kind of environment that attracts a variety of Sacramentans. Der Biergarten isn’t the only German-style beer hall slated to come to Sacramento, as plans to open another location in the former Lounge on 20 space are in the works. The other, LowBrau, will be four blocks from Der Biergarten, at 20th and K streets. Members of the MNA did express concern, as noise complaints have plagued the busy intersection within the last few years. Some critics have been quick to point out the seemingly high concentration of alcohol-centric eateries has caused trouble in the neighborhood. Kimio Bazett, owner of The Golden Bear, a bar next to the space that Der Biergarten will occupy, recently told The Sacramento Press that he is happy new businesses – including Der Biergarten and Anatolian Table – are choosing the area. He said that he expects that the additions will increase foot traffic and help his business as well. The Derfields said they are excited to bring new flavors to Midtown. Der Biergarten is scheduled to open in February 2013, with plans to be open from 10 a.m. to midnight, and potentially as late as 2 a.m. on the weekends.